Have you wondered what it will be like to play blackjack in the year 2040? Read Vinny DeCarlo's article for a glimpse into the future. If you don't know the details of how the IRS can catch you for not reporting your winnings at blackjack, you'd better read Basil Nestor's excellent article on Blackjack and Taxes. Ralph Stricker writes about a loyal player and friend that played on his blackjack team for nearly 20 years. Have you ever wondered why basic strategy is different for single deck from six decks? Read John Grochowski's article for the answer to this and other reader's questions. Mark Gruetze summarizes the blackjack playing rules that must be followed in all the new blackjack-table games that have started in the Pennsylvania casinos. If you've never been to the Greenbrier Resort, read Riverboat Flyer's report on this world-famous resort and its newly opened casino. Frank Scoblete and his team of reporters provide the latest update on playing conditions in A.C., including an incident that happened to several dice controllers that you might find interesting. Kenneth Smith concludes his story on a recent blackjack tournament that he played in, including details of a decision that he made on a particular hand (and the outcome). Frank Kneeland explains how he formed his famous progressive video poker teams and who some of the team members were (you definitely will be surprised). Before you get overly excited when you are a dealt a pocket pair in Texas Hold'em, read Bill Burton's article on how to play them. Finally, we have the schedule of major blackjack tournaments in November and December courtesy of www.blackjacktournaments.com. How does a paid BJI Membership work? New readers to Blackjack Insider may not know that you can purchase membership to our monthly online magazine for only $19.95 a year. As you read through the articles each month, you'll notice that some require a 'login' to read the full article. That's where a paid membership comes in! About 1/2 of all articles each month are reserved for paying members only. Of course, they tend to be our best articles... the ones that will help you make the most of your dollars in the casinos! only $19.95 for one year (12 issues)! E-mail subscribers can also read each month's issue online at our web site: BJI Issue #130, November 2010. PLUS... get both You've Got Heat and You've Got Heat Vol. 2 e-books by Barfarkel. 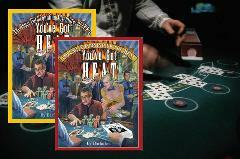 Free copies of You've Got Heat and You've Got Heat Vol. 2 e-books by Barfarkel. Fascinating true story of a card counter who starts his new career with a $2,000 bankroll and hits Las Vegas and Reno. Ride along on Barfarkel's learning curve in this honest, humorous and provocative account of one man's counting experiences as he tries to grow his bankroll while meeting and learning from other wise guys and advantage players along the way. Barfarkel leaves nothing out: the emotional highs and lows of his bankroll swings, the gourmet comped meals, the backoffs, and his encounters with the "professional" women of Nevada. Over 400 pages. Normally $30... yours free! Free 3-month subscription to Midwest Gaming and Travel Magazine, mailed right to your doorstep! That's three free issues of the #1 magazine that covers gaming (and attractions) in the Midwest. Normally $24 per year..
Get Access to 800+ prior articles! : Your membership includes access to our complete archive of back issues going back many years. Over 800 articles for you to read whenever you want. NOTE: This offer not valid for Blackjack Insider renewals (new subscribers only). If you are a current or past subscriber and use this offer, you will receive a new user id and password active for one year from now and your old account will expire normally. This offer valid once per customer/e-mail address. The promotional items above may not be provided to existing or past users of the respective services (i.e. existing Green Chip members or Casino Player subscribers). "No one, however, speculates about the future of blackjack (or any casino game, for that matter). Well, I just perfected my time machine and took a trip to, and back from, the future, where I saw the state of blackjack in Las Vegas casinos in the year 2040. I was also lucky enough to get my hands on the latest Nevada Internal Casino Control Requirements (which were updated in 2039). So not only did I get a gander at what's going on 30 years from now, but also why. In a nutshell, here's what you can expect..."
"Taxes? Yes, you must pay taxes on your gambling income. And if you don't plan carefully, you may have to pay taxes even if you're a net loser! Yikes! So don't ignore the issue. Prepare now..."
"Why is the basic playing strategy different for single deck vs. six deck?..." "I have not mentioned the name of Gary S. in any of my previous articles. I believe now is the right time to mention him so I can give him my deepest appreciation for his friendship and loyalty over the past 30 years..."
"Table games in the Keystone State went live in July, with the state setting detailed rules that apply to all casinos. Most importantly for blackjack players, the Gaming Control Board stipulates that naturals be paid at 3-to-2. Other player-friendly rules include..."
"There is a new casino at the Greenbrier Resort in White Sulphur Springs, West Virginia. To appreciate the "Casino Club at the Greenbrier," you must first have an appreciation for the Greenbrier Resort. At most American casinos, the resort is built around the casino, which is the core business. However, at Greenbrier Resort, The Casino Club is just one of many amenities that they offer on the property (others include golf, tennis, horseback riding or falconry). The Greenbrier is first, and foremost, a world-class resort that has been in business serving customers since 1858..."
"Frank Scoblete and his team of reports provide the latest update on the blackjack playing conditions in A.C..."
"In the October issue of the BJI, I began the tale of a recent tournament at Horseshoe Southern Indiana that I played in. Last month's article left you in the middle of my decision-making during the final hand of round two. The results of my decision may surprise you..."
"Just as it is nearly impossible to play progressives without ever running into a "team," it is almost impossible to bring up the subject of progressives without mentioning "teams." In light of the inevitable interconnectedness between teams and progressives, and with the current culture of anti-team sentiment, I thought it best to mention from whence teams come before teaching you how to start one..."
"A 'pocket pair' is when you are dealt two cards of the same value in your starting hand. You may also hear it referred to as a "wired pair." Although a pocket pair has instant values, some players tend to over value them..."
"Check out the schedule of major blackjack tournaments in November and December by region in our Blackjack Tournament Report courtesy of blackjacktournaments.com..."